Quantum W is a smaller version of Quantum XL with 3 microphone/line inputs instead of 5 but with all the power of its bigger brother. Quantum W inherits world-class IP technology from the Prodys Ikusnet Video Codec Family: Automatic Jitter Buffer, Adaptive Bit rate, Bonding of up to 7 IP links (Ethernet, 3G/4G, Wifi) for secure audio streaming with the best possible audio quality. 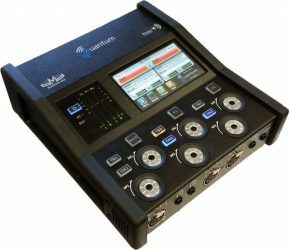 Up to 3 Mono Audio Inputs available to be mixed, encoded and streamed in Stereo mode. Bonding or Diversity with up to 7 IP links for secure audio streaming and the best audio quality possible. 2 x Ethernet interfaces: Either to split streaming and control or for bonding/diversity 2 IP links. 4 x 3G/4G IP data links with bonding capabilities. Internal modem or External 3G/4G module for better reception. IP Compatibility: SIP/SDP/RTP/STUN protocols are supported according to the standard defined by the N/ACIP project within the EBU group. Independent Level Control (local or remote). Tx/Rx audio level balance control. 2 Ethernet ports for bonding, diversity or splitting control and audio stream. 2 RJ45, 10/100/1000BaseTx Ethernet connectors. DHCP, SNMP, DNS, RIP, SNTP, SMTP, HTTP, IGMP, ICMP, VLAN. SIP/SDP/RTP/STUN comprising Tech 3326 EBU N/ACIP standard. SIP Diversity with two IP interfaces according to Tech 3368 EBU N/ACIP standard. FEC as per RFC 2733. Prodys NAT Traversal Streaming Protocol. Wi-Fi interface 802.11 b/g/n compatible. Available for bonding or diversity with Ethernet and/or 3G/4G. 1 Internal modem and 2 USM modems. External Communications Module. with up to 4 3G/4G SIM cards. 2 contact closure inputs and 2 relay outputs. User configurable. Remote contact closures. Tx and Rx of ancillary data along with the audio. Input: 100-240VAC, 1.8A / Output: 19VDC, 3.42 A.
Width: 210 mm; Height: 80 mm; Depth: 235 mm.